President Obama is signing an executive order today raising the minimum wage for federal contractors from $7.25 to $10.10 an hour. The order will also raise the “tipped” minimum wage for these contractors to $4.90 from $2.13 an hour. These minimums will increase with inflation. The order applies to new contracts and over the next few years will increase pay for hundreds of thousands of workers. The order also ends a practice of paying disabled “14(c)” workers subminimum wages, currently averaging $2.15 an hour. Progressive lawmakers have told President Obama he should unilaterally raise the minimum wage for federal contact employees, saying it would allow him to fulfill his promise of helping low-income earners without waiting for congressional action. … Reps. Keith Ellison, D-Minn., and Raul Grijalva, D-Ariz., co-chairmen of the Congressional Progressive Caucus, wrote Obama a letter Dec. 4 telling him to take the “bold step” of issuing an executive order that would increase the wages for workers on federal contracts. Also a new organization called Smart Capitalists for American Prosperity held a press conference Tuesday to call for an increase in the minimum wage. Included in this group are former publisher of the American Conservative Ron Unz; investor and former White House Chief of Staff Erskine Bowles; famed venture capitalist and Managing Director of Greycroft LLC Alan Patricof; real estate mogul Jeff Gural; venture capitalist and co-founder of Alta Partners Garrett Gruener; co-founders of Ben & Jerry’s Ice Cream Ben Cohen and Jerry Greenfield; investor Peter Stamos; TV Host Rick Steves, media investor and entrepreneur Leo Hindery, Jr.; former investment banker and Harvard Business School professor Rob Kaplan; investor Daniel Berger; investor Lawrence Benenson; film producer Richard Food (Fear and Loathing in Las Vegas), and a number of others listed on their website. 2. IT‘S GOOD FOR AMERICAN TAXPAYERS. 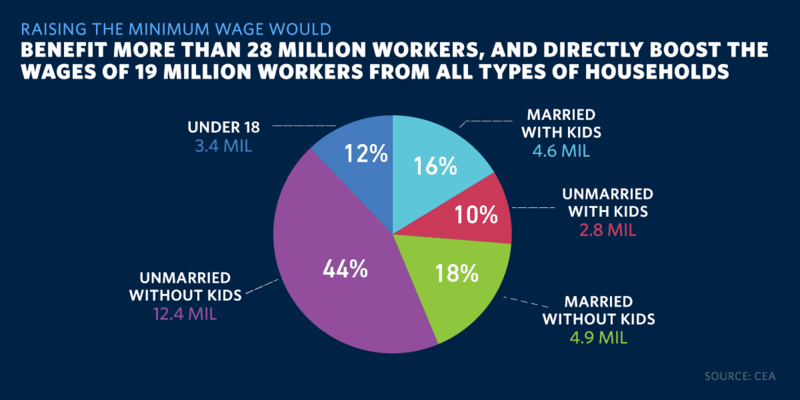 Minimum wage earners don’t make enough to support their families and as a result many rely on government programs to make ends meet. A decent wage would increase the number of self-reliant Americans and decrease government expenditures. 3. IT’S GOOD FOR AMERICA’S GLOBAL LEADERSHIP. The U.S. is the richest county in the world but its minimum wage significantly trails that of other developed countries. In order to maintain its global leadership, the U.S. must ensure decent earnings for its working citizens.